Step back in time to the 1860s and you would have seen the Sisters of the Good Shepherd provide shelter, food and work for thousands of vulnerable and poor women and girls at The Abbotsford Convent. Not so today. After The Sisters moved out in 1975 the convent sat empty for some time until its resurrection as an artist's space. In stark contrast to the drab daily routine strictly enforced by the nuns, The Abbotsford Convent is now a space like no other in Melbourne. It serves as a creative space for writers and designers, art organisations, rehearsal and development, and includes indoor and outdoor function spaces, a school, a radio station, a bakery, cafes, restaurants, bars and more. 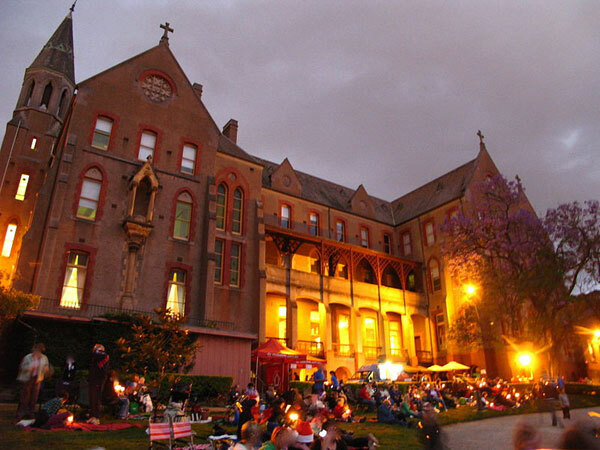 There is lots to see and do at the convent which boasts ten different buildings. For $15 you can take the 2pm guided tour on Sundays (find the store and pay when you get there) to hear all about the history of the site and what it's used for today. If you're looking for a cheap day out browse the store which includes a gallery or visit during one of the many markets or events held here. If you're after a bit of evening action the outdoor Shadow Electric Cinema runs during the warmer months and is within the Shadow Electric bar so you won't have to venture far for your refreshments. If you're looking for something a bit more substantial (and unusual) stop by Lentil as Anything where there is always a yummy range of vegetarian meals on offer. The 'unusual' in this restaurant is you pay what you feel the meal was worth. There is no menu or set prices here! If you've only got time for coffee and cake take your sweet tooth along to the Convent Bakery.